2016 began with a riot of fun. For the first time in many years, the effort that went into setting up our home for Christmas saw fruition with family and friends joining us for a week of celebration – at home and at our second home, the Maasai Mara. The new year was ushered in with much song and dance, food and drink, fun and frolic. And as usual with a lot of good wishes and hope for all. Unfortunately for us, the new year quickly lost its sheen as illness, pain and ultimately death took its toll on our family. The year has been one of the worst for me, personally. The devastation is immeasurable and the void impossible to fill. No one, after all, can be a mother, but a mother. Add to this the physical upheaval of moving to a new country at just this time of year, a lack of treasured, familiar and comforting possessions that are yet to reach us, and it becomes a bit obvious why this Christmas sees us low key. Yet I refused to allow the gloom of the fading year to take away from the spirit of this season which is all about peace, love and festivity. For this is one of the many lessons I take away from my childhood – a celebration of all events happy, a spirit to never say die, even in the face of death itself. It is, for me, the continuing of a tradition that should not be broken – not just Christmas but the need to look for the light beyond the darkness. Christmas, through my growing years, has always seen us have a small tree – of any species, sometimes of plastic, sometimes of paper – decorated with whatever we could afford and lay our hands on. The one common thread running through the years being – joy, celebration. So, irrespective of the need to pay excess baggage to the airlines, compromising on the essentials of living and trying to squeeze all that we needed into a few bags of accompanied luggage I chose to bring with me this tiny tree and decorations – for me the epitome of an African Christmas. Therein lie many short stories. 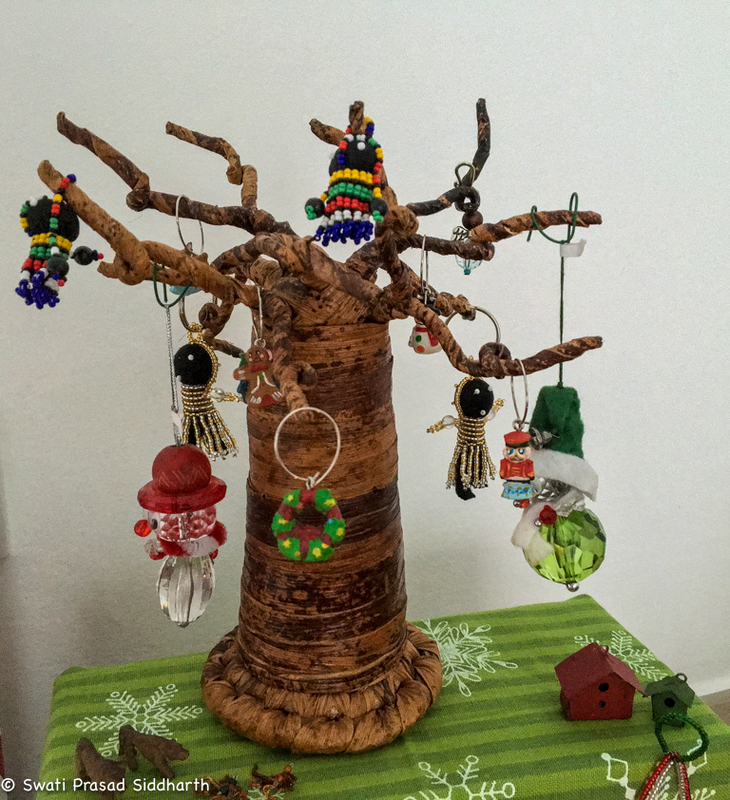 The tree, all of six inches, is made by Stephen, a Kenyan craftsman whose raw material is banana fibre. The decorations are Zulu beadwork from South Africa. Some of the hangings are wine glass identifiers! 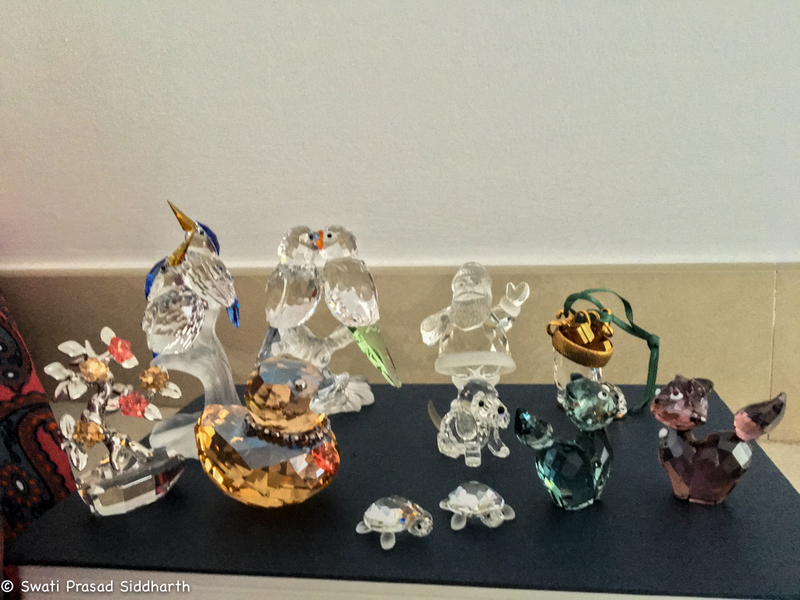 The crystals are many years of collecting, each with special memories. The stars are Maasai beadwork created by Maasai women in the Mara. 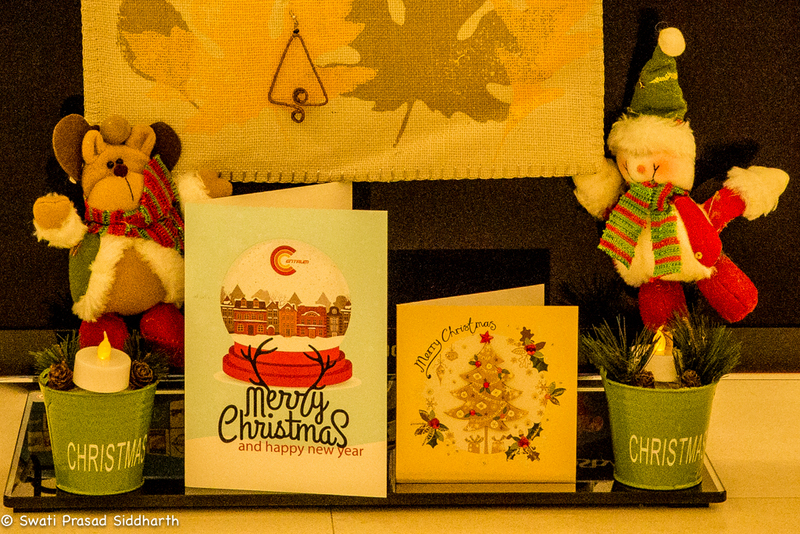 These are the first Christmas cards we have received in many years. I am so happy that the tradition of greeting cards continues in this age of instant messaging across the globe! Then there is the backdrop. Or the underlay, if you must. Kenya has many traditional fabrics. The kikoy, the shuka, the kanga … This is a kanga. It is a length of cloth used as a scarf, a skirt, a cradle for a baby and anything else you can think to use it for. The cloth is a soft cotton, the colours are vivid and the prints bold. But every Kanga has on it a strip of writing – an idiom, a saying, a philosophy. As a final souvenir of our wonderful stay in Kenya, I had picked a grey and mustard Kanga to use as a table cloth, fortuitously finding matching napkins! As the lady at the shop was taking her time billing I went back to the shelves and discovered this red and grey beauty. I instantly asked her if I could exchange the two. She was very gracious and allowed me to do so. 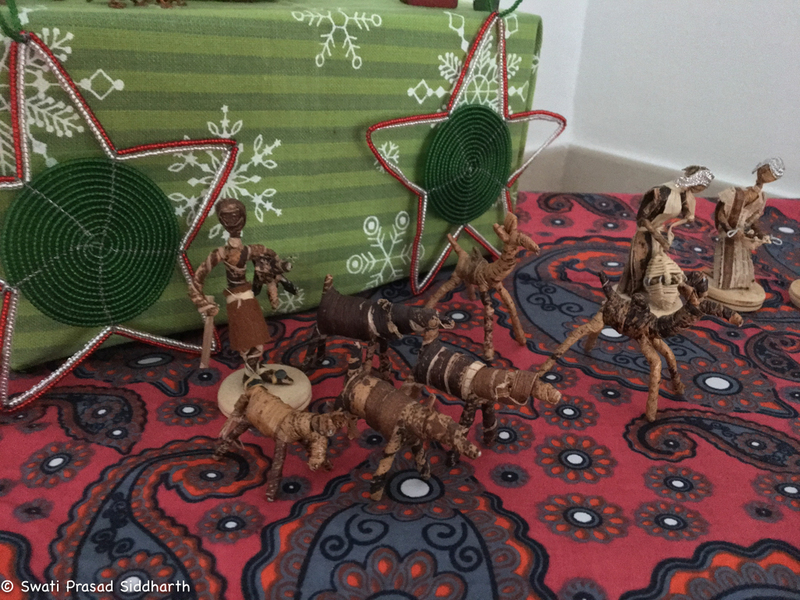 While she finished wrapping my other purchases, I idly asked her what was written on the Kanga. What was the wisdom that I would be sharing with my next dinner guests? Her reply still stuns me with its appropriateness, with the hand of fate that made me pick this particular piece at this particular moment in my life … “My mother, I will always remember you”. 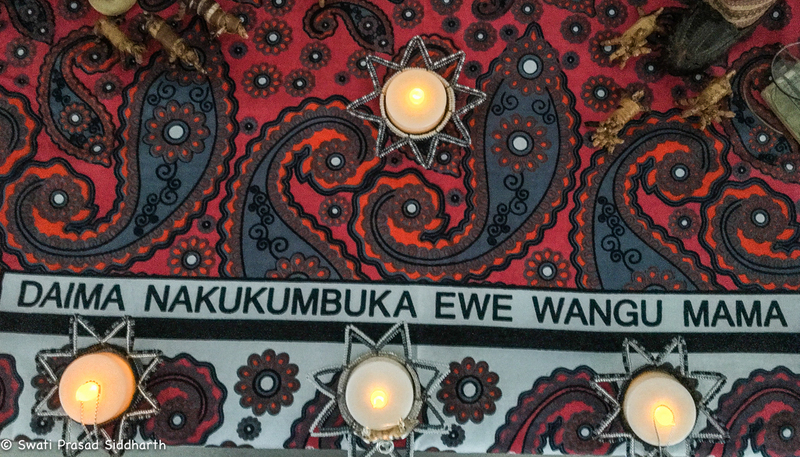 The candle holders are, again, made by Maasai women under the aegis of the MAA trust. Unashamedly, I dedicate this Christmas to the woman who is responsible not just for my existence but for the spirit of living she nurtured in me; for the example of generosity and giving she set for me with her every action; for her courage and strength to face every adversity with a smile in her heart that she hopefully has bequeathed to me. She will be a hard act to follow. Thank you for your encouragement. Yes West Africa waits while the Mara will always be home for us. We all feel the pain and hopefully time will be a healer just like it was after appa passed away. Also, Nigeria should grow on you guys over time, as you explore the western part of Africa. For now we all remember the lovely time we had last Christmas and Mara will always be a must go back destination on my list. Thank you for your very kind words, Sherri. Thank you. Yes we did have some amazing years together, did we not, and created lovely memories! What a tribute! Love and hugs. No words to express. Truly moving. Embodying the true spirit of Christmas . Story of the Christmas tree and the decorations are awesome. I salute you . Thank you, Binu. I need to try and live up to these expectations you continually have of me! Merry Christmas! 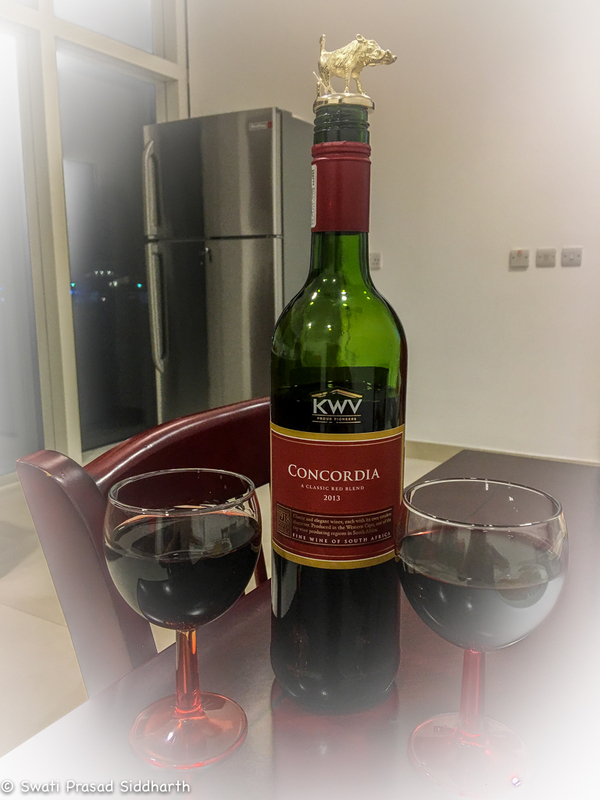 Your write up is indeed a celebration of life and love…. Just as the tree is!! Every detail so beautiful!! I knew there would be a story behind your Christmas decorations and reading this article has made it clear. I love your spirit of never giving up. Wishing you the best in 2017 and looking forward to seeing your new projects. Thank you Vijay. Yes I guess you understand – and really your loss is so much greater – for I was fortunate to have her with me so long … hopefully I have learnt something from her life, as you must have from your own Mother. Take care and have a beautiful future. Dear Swati , at the outset I wish you and Sid Merry Christmas ! This piece you wrote speaks volumes of your never dying attitude ! It so effortlessly touched upon the most beautiful person on earth … Mother !! I can see your pain which I have gone through 24 years ago when my Mom left for her heavenly abode ! I see your strength in coming back from such a Colossal loss and look forward with hope and optimism !! All the stuff you collected from Africa are son beautiful and precious ! That tree is the most beautiful one I have in ages !! Look forward to meeting you in the new year . Beautiful words…your mom must be smiling in heaven. Merry Christmas and a Happy New Year, dear Swati. And I constantly touch wood. Yes. I know I have been more blessed than any one person ought to be. I am grateful for that, indeed. Nice….and not everyone is fortunate enough in this world to have such a binding relationship with their biological parent…..so, cherish it and live the dream…..Never say Die….come what may…..that is what being in this family is constantly teaching us. Thank you for sharing your tender heart with us through this lovely holiday display — each of these treasures is especially beautiful because of how much meaning they hold to you. Finding meaning and beauty even in times of sadness is not easy but you have lit the candle of love. Thank you for holding your light up for us. Bless you and may your mother’s spirit rest in peace.